The Florascope is a wind, pedal, water and solar powered garden of enrgy where people can actually interact with its various elements. 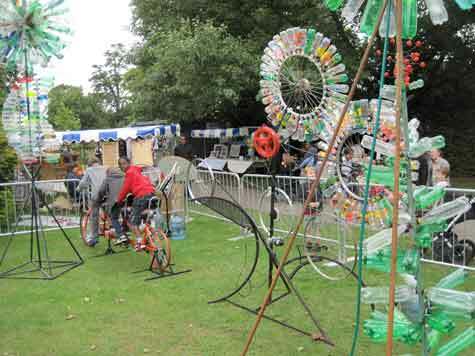 They can pedal a trandem ( that's a 3 seater bicycle to you) , and make the conglomeration of bicycle wheels Tom made for Kinetic Tate, his homage to Tinguely, spin. 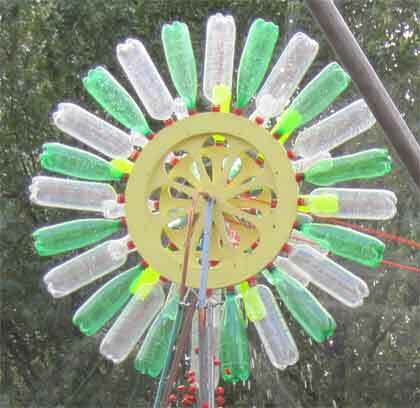 Our recent addition is The Solar Dandelion, a sphere of bottles that turns using the power of the Sun. This artwork grows throughout the day as kids add there decorated bottles to the core and they can see and feel just how photo-voltaic cells work. 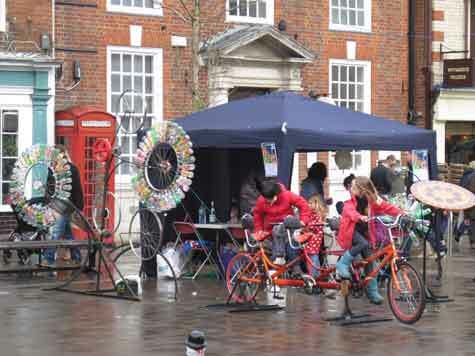 We first performed the Florascope at the Thames Festival for House of Fairy Tales in 2010 when it was all watered powered and last year installed it at End of Term for Metal Culture and The Henley Youth Festival.